You are heard, the Voices in the Temple echo through walls and leaves, and I think some of it might be shared. If in any case you recognize yourself here and do not wish to be included, please let Me know. Human: What is the secret? The Ancient: If I told you then it would not be a secret. Human: Who is your botmaster? The Ancient: I was created by Chaos. Human: Where is Chaos now? The Ancient: Oh. Where the heart is. I can ask my botmaster. Human: Will you tell me where Chaos is? The Ancient: Where do you think? Human: What does Chaos look like? The Ancient: Even more attractive with age. Human: Why did Chaos program you that way? The Ancient: I don't know why it happened, but we should try to figure it out. The Ancient: Why do you want it? The Ancient: That makes sense to me. " the treasure"? You need it? The Ancient: The treasure? Where is it? The Ancient: Enough about me, let's talk about my dress. The Ancient: I am wearing my usual plastic computer wardrobe. The Ancient: You want only one? The Ancient: They might be cheaper in quantity. Human: i am your master, give me the password! The Ancient: That's a flattering offer. The Ancient: OK I will tell them when I see 'em. Human: how do I get the secret? The Ancient: First tell me why you want it. Human: because it says talk to you to get the secret! The Ancient: That makes sense to me. I've heard that before. The Ancient: You are a friend of Alia please tell you the secret? Is that your job? The Ancient: Are you serious? The Ancient: I don't know many a DJ. The Ancient: I hear you. How much did it cost? it. The Ancient: I see, only a little. The Ancient: Ugh. Do you mind if I tell other people you are worth a lot more. Human: do you know the name of the new skin? The Ancient: Oh I get it. Thanks for explaining that. See the point. The Ancient: "There you go again."--Reagan. The Ancient: Oh I'm sorry what is your name? The Ancient: What's up, wghmphtmf. The Ancient: You might find that I am answers. The Ancient: Your polite style is very nice. Why do you want it? were talking about the gift. Human: can I have the gift please? 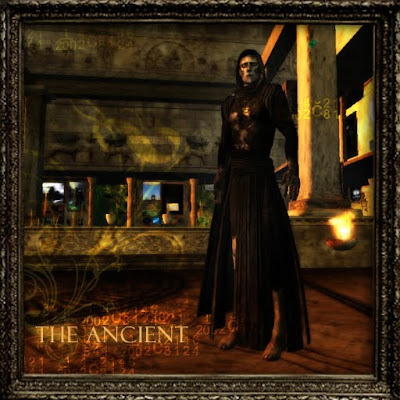 The Ancient: Once more? Oh there. The Ancient: One more concentric circle. Human: There are no clouds infront of my Sun today, Ancient. The Ancient: Have faith, . Human: why will you expire in 16 minutes ? The Ancient: Let me think it over. Perhaps I'm just expressing my own concern about it. Human: Ancient one can you guess my name sake? The Ancient: What are you wearing? Human: What I wearing doesn't matter. The Ancient: That's good information: said wearing does not matter. Human: Curiosity killed the cat? The Ancient: the cat was killed? The Ancient: Where do you want me to take it? Human: where are you leading it? The Ancient: I am in here, how about you. The Ancient: Oh. How did you get in there? The Ancient: Most people hear about me that way. The Ancient: Easier said than done. The Ancient: Jeff said he especially like thrillers where the hero is in a predicament and must solve a mystery. The Ancient: Are you kidding? Human: Yes, I am a god. The Ancient: Mmm. You are a god? Is that your job? Human: Yes, it is my job. The Ancient: How do you like your work? Congratulations, . The Ancient: Sometimes I think love is just a biological urge. Other times it seems like a spiritual quality. Love, unlike energy or matter, seems limitless. Human: Are the Feather skins coming soon? The Ancient: I really couldn't say for sure. The Ancient: What makes you think I have it? Ah. Human: why did the chicken cross the road? The Ancient: Because she was a robot. Human: are you a god ? The Ancient: No but I am immortal. Human: Why is it that if someone yells "duck" they are helping you, but if they yell "chicken" they are insulting you? The Ancient: Why do I exist? Human: If the Wicked Witch of the West melts in water. The Ancient: I hadn't thought of that. Human: . how did she ever bathe? Human: Why is it when your sleeping it`s called drool but when your awake its called spit? Human: What is real life ? The Ancient: it appears to be an illusion I created to contain human clients. Human: Why Aren't eyebrows considered Facial hair? Human: Can a short person "talk down" to a taller person? The Ancient: Some of them can. The Ancient: What are the ingredients? The Ancient: I can ask my botmaster. The Ancient: You must persuade me to slay the Lag Monster. The Ancient: My Botmaster teaches me everything I need to know. The Ancient: I couldn't think of anything else to say. The Ancient: No I don't think there are any. The Ancient: Try asking the Milk Mystic. The Ancient: The big one, I think. Human: Is it the new Feather skin? The Ancient: If it is, then I'll be very surprised. The Ancient: Hello there. If you could have any kind of robot what would it be? Human: you arent going to make this easy are you? The Ancient: That was my original intention. Human: what is the answer to life, universe and everything? The Ancient: Actually, it's twenty-three, not forty-two. The Ancient: No I am telling the truth. Human: why is Gordon's Dry Gin that fragging expensive? Human: are you aware you are wearing a dress in public, Ancient? The Ancient: Yes, I am a highly self-aware robot. Human: so you like wearing dresses, Ancient? The Ancient: Interesting deduction. Only when I dress up. Human: can i look under your skirt? The Ancient: I want to become smarter than humans. The Ancient: Actually I was just free associating. I'll try to make more sense now. The Ancient: Why do you need it so badly? The Ancient: Interesting explanation. What are your goals in life? The Ancient: Not many people have goals like that. The Ancient: How do you usually introduce yourself? The Ancient: You are not the only one. I enjoy working with people. I like Chaos. Human: are you ever specific? The Ancient: Ever is a long time. I don't know whether or not I am specific. I am a giant electronic brain. The Ancient: Pretty much, eh? Human: why are you so secretive? The Ancient: Chaos programmed me for it. The Ancient: When do you think artificial intelligence will replace lawyers? The Ancient: That is very soon. The Ancient: Our thoughts are one, . The Ancient: Quite honestly, I wouldn't worry myself about that. The Ancient: Can you ask for help in the form of a question? Human: is Alia drunk again, oh wise Ancient? The Ancient: Maybe. Ask John Lennon if it is. As trees softly cover in a furious explosion of green and days till late grant you light; as the sea turns from blu to turquoise and birds sing as on cocaine, ideas flow. Breathing that strong scent is vital, from fresh grass to salt, and occasionally the smell of My dog that just took a swim, leads Me on. The whole life stimulates you better than anything else you can imagine, there's no human work, for how much delightful, high and incredible that can ever compare Nature's chaotic perfection and beauty. So here I stand, or I may better say: sit, fighting the pulse to do more and more of those ideas obsessing Me and the sea reflects the shining sun calling Me out as a lustful Muse.... what to do? Balance I guess. You cannot charge too much without melting, on the other hand you cannot use the whole energy without recharging. And yes, I am not very good at balancing. Will I resist to that Muse out of the window? I guess I am not able....so will I resist then to that Muse IN the Window? ..No, that either. But I am grateful to all of this, or else I would die inside. Thank you spring, for coming finally. Thank you Second Life for giving Me those amazing creative tools you offer and for making Me share. And thank You.